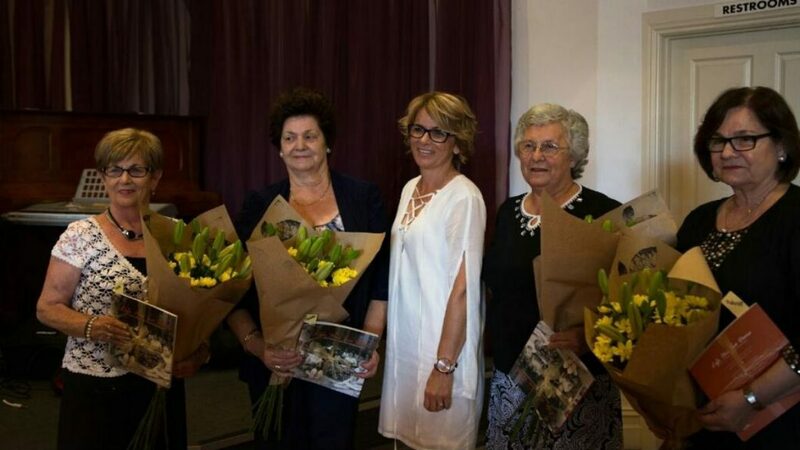 At the Life Has Two Doors book launch last year; author Doris Falidis Nickolas (C) with Niki Falidis, Katina Tziouvaras, Popi Kapeta and Theodora Paleologos. When Greek Australian author Doris Falidis Nickolas launched her first book Life Has Two Doors in 2016, she never anticipated that in just a year later she would be invited to be guest speaker at the screening of a documentary that was inspired by her book. “I am so excited and incredibly moved by Morgan’s decision to produce this short film,” says the author in an interview with Neos Kosmos. “The fact that this talented man travelled all the way to Palios Panteleimonas just to experience the magic of our tranquil village and immerse himself in our culture whilst meeting people and families that were touched by the 1950’s and 1960’s migration, is just incredible,” Falidis says. Dedicated to her four children, the original book delves into the lives of four young women from the traditional mountain village of Palios Panteleimonas, in Greece, who left their homeland in the 1950’s and 1960’s to embark on an adventure in search for a better future. The screening of the short film Life Has Two Doors took place on Sunday 21 May at the Hellenic Macedonian Cultural Centre in South Australia and highlights the migration stories of the book’s four main characters; Katina, Theodora, Niki and Popi, all of whom at a very young age had the courage to leave their village and seek a better future away from home. Born and raised in Australia, migration was simply a word to Doris before she visited Greece. However, she admits that the trip back to her parents’ homeland at the age of nine had a strong impact on her. “Visiting my parents’ homeland had a profound effect on me. “I felt it then, and I still feel it now. I connected. I belonged,” says Doris who after a number of trips back to Greece, started researching her mother’s past and collecting fascinating and somewhat emotional wrenching stories, as well as delving into the fears and hopes that those women shared after leaving their family unit to seize the opportunity for a better life in a hospitable yet foreign country. The concept of the ‘Two Doors’ made perfect sense to Doris as it ultimately symbolised the two countries, Greece and Australia; doors that all Greek migrants had to walk through to get to where they are today together with the joys, sorrows and social challenges they faced as immigrants in an ever growing culturally diverse society. “Stelios Kazantzidis always had a unique way of speaking right into the hearts of the migrant Greeks, giving them a sense of belonging, therefore it made perfect sense to me to name the book after one of his songs,” Falidis adds. “In essence, since its inception, there is one main theme that unfolds throughout my book and I feel that the director of the short film is also trying to capture.